There is nothing quite as depressing as the sight of what is on the Zombie Stack T-Shirt. You will swiftly begin to utter prayers or curses upon seeing this graphic tee, possibly interspersed with a, Why Me? And truthfully, those feelings are quite understandable, really. Anyone who encounters a stack of zombies this emaciated and hungry is bound to find themselves wondering what they did to deserve that sort of cosmic punishment. 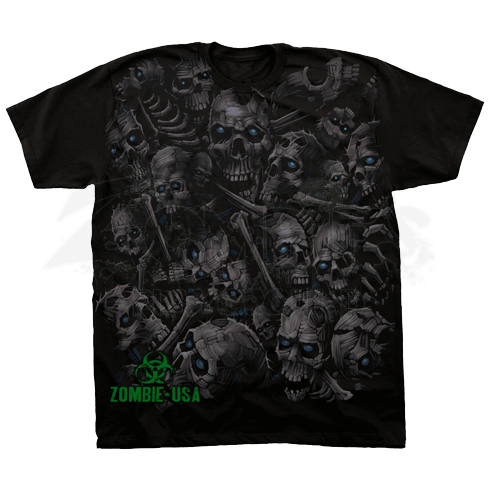 This stylishly undead tee shirt shows a stack of near-skeletal remains of several zombies. We say near skeletal because given that many of them still have eyes, they are obviously not quite killed yet still dangerous. Granted, a skull itself is not really all that dangerous on its own, but a zombie skull that is still biting and chewing should still be considered a viable threat. Many of these graying remains are patchworks of bone and sinew, although many of them still have the dull blue eyes that blankly stare and signify an undiminished hunger for brains. Regardless of the danger a stack of starving, not-quite-dead zombies might prove, the Zombie Stack T-Shirt is still a really cool shirt to wear every now and then. It forces others to face a situation that they might find themselves dealing with, should a zombie apocalypse ever occur.